P.S., After all that, the bank account STILL didn’t come through immediately. How many of you saw that one coming? My account remained blocked for some unknown reason, even after the requisite waiting period. The post office branch where I made the account sent me to the main bank. The main bank looked in the system and said the post office hadn’t entered all the necessary information (even though I had stood there and watched them do it–maybe they forgot to hit ”Send”?). I should have gone to the main office to open my account, not to the post office (by the way, I went to the post office because when my husband went to open an account they told him that they were only opening accounts at the post office. Yeargh.). None of the identification I had on me was sufficient to deal with the problem. Could I come back with my passport and proof of residency? At which point I lost it and I read the poor clerk the riot act. I had watched the clerks at the bank check and double-check my information and then enter it into the computer. No, I didn’t have extra copies of all the paperwork. I’d have to go collect it all over again. Now, I didn’t know where the error occurred, but it’s obvious that someone had done their job incorrectly and I would like the situation fixed. My voice rose and the “helpful” security guard who likes to announce to everyone each time I arrive that I don’t speak Portuguese but they can practice their English with me came over to stand helpfully (watchfully?) in the corner of my vision. I’m not crazy, thank you. I certainly don’t plan on attacking anyone. I realized that this poor clerk couldn’t fix my problem then and there, but can you believe that their mission statement actually cites “efficiency”? It’s on the walls, front and center. For crying out loud…. “Mission: To be a competitive and profitable bank, to promote sustainable development in Brazil and to carry out our public function with efficiency.” Ahem. Since my passport was at home, the next attempt all had to be delayed to the next time I was in town during their office hours of 10am-2pm. Meanwhile my husband had to go to the bank later that week for business stuff. My friendly security guard mentioned to him I had been there and angry (sigh–gotta love small towns). My husband defended me and my frustration (love him!) and he laid down a white lie that I had called the main 1-800 line to file an official complaint (we had talked about me doing it; I hadn’t gotten around to it). The following week I went back with my passport and all copies of the relevant documentation that I still had onhand. Amazingly suddenly they didn’t need it, The papers that hadn’t been entered by the post office were magically in a drawer there at the main branch. I signed all the paperwork all over again, I was actually able to give them some of my money to deposit the next day, and my ATM card arrived as scheduled within the next 15 days. Done! I have never worked so hard to give my money to someone in my entire life. P.P.S. With this victory in hand, I set out to finally transfer my U.S. driver’s license to a Brazilian one. I had my little checklist from the first try where I got turned down for not having a RNE# yet. I copied all the paperwork, updated the pages that had changed in past year and caught a taxi back to the closest Civil Police one hour away. I arrived at 11:30am to learn that they were on strike and only attending on a first-come, first-serve basis at 8am each morning. I came back the following week, armed with a sandwich (we pregnant ladies gotta eat) and a crossword puzzle. One of the men in line in front of me paced and checked and re-checked the order in which people had arrived. I felt a strange compulsion to comfort him, a seasoned veteran to a new practitioner. I finally made it to the front of the line. The clerk told me that they no longer process such resident applications from the local office. The rules had changed in the past year. 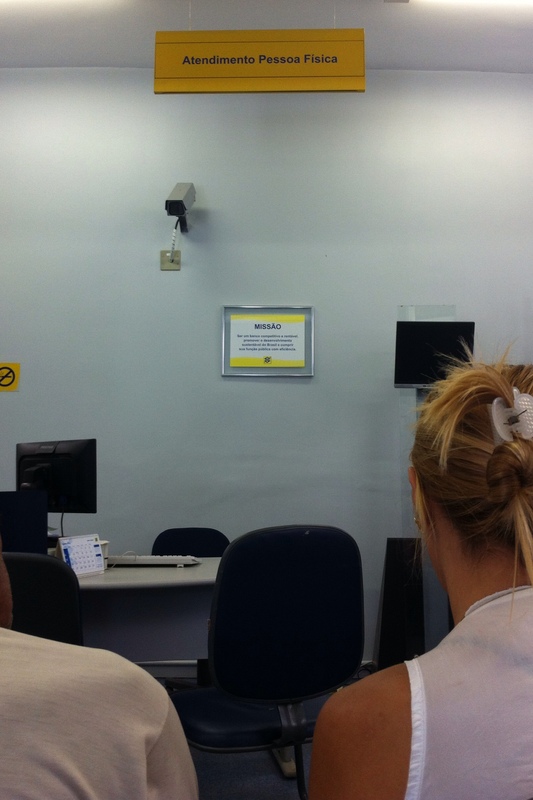 They now only process resident applications for drivers’ licenses in Belo Horizonte. I’d have to go there to apply. That’s at least a 2-day and R$500 trip, y’all. (USD$250, including hotel, food, and bus fare, and not including the filing fees). Hmph. Malvina: 1. Bureaucrazy: Still winning. Previous Post: « Back of the line Grandma! Oh dear… My Canadian driver’s lisence is still valid until something crazy like 2016, so here’s hoping that by then we’ll moved to a larger city because over here there have no idea how to deal with an “abnormal” (aka: a foreigner) situation. Sigh.